Science is the ability to understand and explore the world. It enables us to have the capacity to impact our community. Prep Robotics did an amazing work. Special Thanks to Kevin Kevin Lerman and Alex O'Neill (mentors from round the corner at Google). Thanks to the team members present; Kyara Valdez (captain), Alexandria Alvarado (driver), Sophie Ahn (driver), Francisco Cruz (scout), Benjamin Boateng, Isaac Okura (programmer) and Tim Tschurjumov (Prep’s own Physics Teacher). Reaction time is the time between a stimulus and your response. The stimulus is processed by your nervous system before you are able to react, and the time lag is your reaction time. This one-semester engineering course, which will culminate in a STEM PBAT, focuses on the iterative engineering design process. This will be done through hands-on exploration of physics and engineering applications. Students will choose from a menu of engineering problems. They will form groups and collaborate in order to overcome that engineering problem, given many constraints (including monetary!). 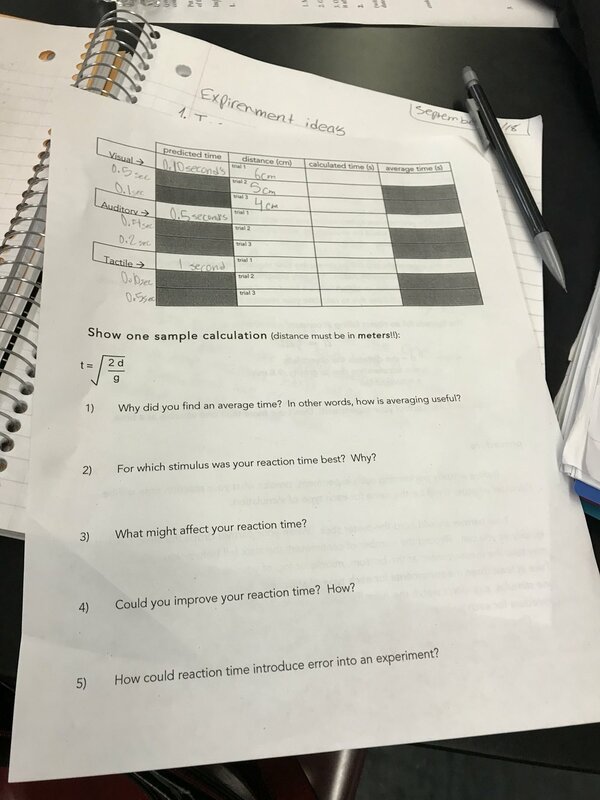 Students discover the connection between real-world events and mathematics before functions are formally introduced, and practice writing about math in preparation for the math PBAT. This unit it addresses various learning styles (visual, verbal, logical, social) giving every student the opportunity to be successful. Robotics Club- Throughout the school year students will be engaged in strengthening their STEM skills, collaborating, problem solving and having fun. Field Trip- Our pharmacology class participated in the Rock EDU Science Outreach Program and Rockefeller University. Under the guidance of professional scientists, students used polymerase chain reactions (PCR) and gel electrophoresis to examine their own DNA. We also discussed the ethical ramifications of studying human DNA and the importance of informed consent in research.